If inspiration fails and you resort to buying someone a gift card for Christmas, you can at least personalise it by taking a few minutes to make a greeting card to go with it. 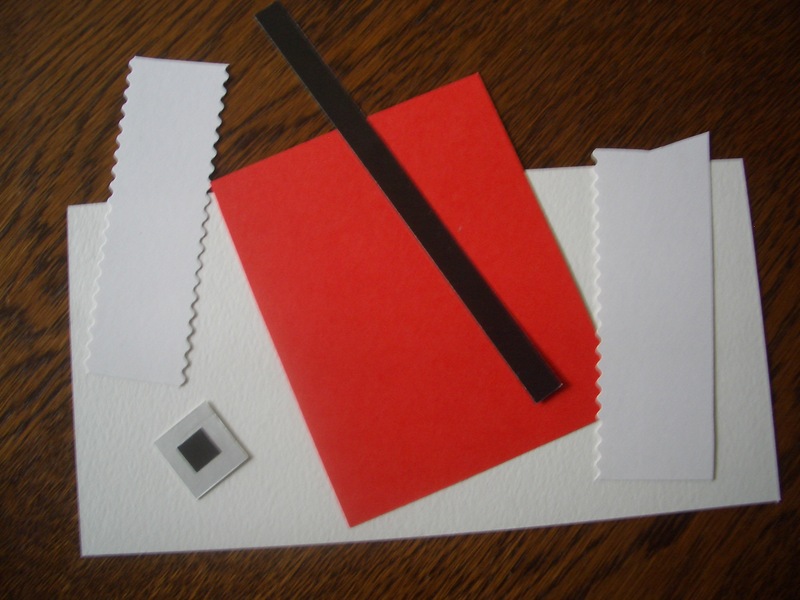 Cut a 20cm x 10cm (8″ x 4″) rectangle from the white card and a 10cm x 10cm (4″ x 4″) square from the red card. Cut a horizontal slot in what will be the front of the Santa card. 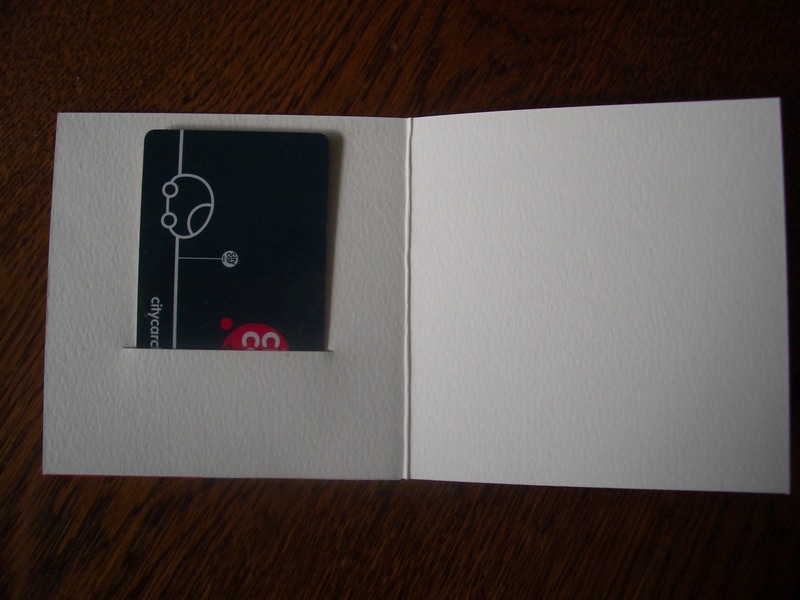 It should be 6cm (2 3/8″) wide, 3.5cm (1 3/8″) from the bottom of the card and centred horizontally. Apply glue to all of the top part of the red square (the part that will be above the slot), but only around the edges on the lower part. Stick the red square onto the front of the Santa card. When the glue is dry, check that the gift card can be inserted from the inside. 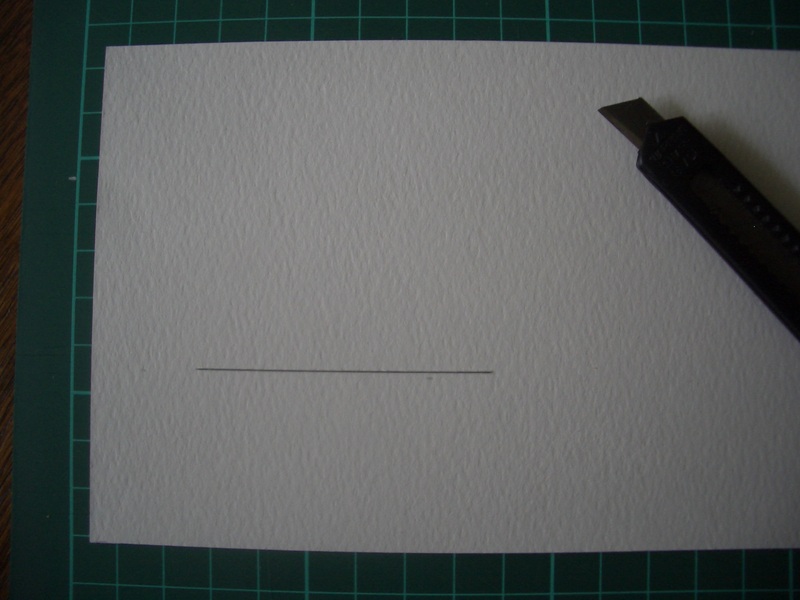 Cut a rectangle of white paper 10cm (4″) long and about 3cm (1 ¼”) wide using the wavy scissors on the long edges. Cut a second rectangle 10cm (4″) wide and 1cm (3/8″) high, using the wavy scissors for just one long edge. 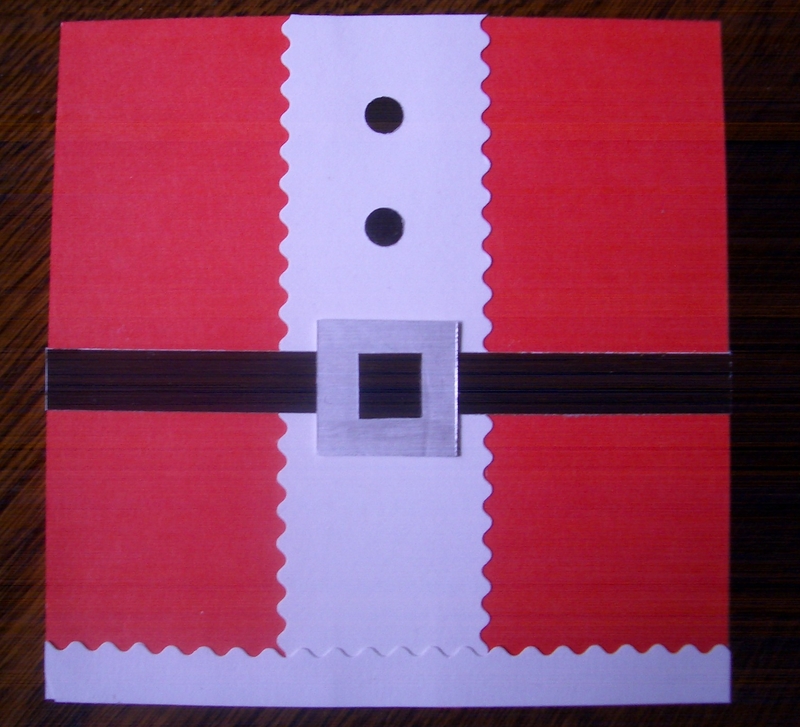 Stick the first rectangle vertically down the centre of the Santa card and the second one horizontally across the bottom with the wavy edge uppermost. For the belt, add a horizontal strip of black paper that is about 1cm (3/8″) wide, sticking it across the middle of the red area. For the buckle, use a 2cm (3/4″) square of silver card with a smaller square of black paper (of sides equal to the width of the belt) stuck in the centre of it. Punch two or three “buttons” from black paper and stick them in place. Finally, fold the card in half and place the gift card in the pocket through the slot on the inside.